Sophomore second baseman Rochelle Draper connects on a pitch Saturday against Fordham. Despite dropping its weekend series to the Rams, GW opened A-10 play with a 5-1 record and strong performances at the plate. Things haven’t been perfect this softball season, with a 12–14 non-conference and 17–18 overall record so far. But when things have gone right for the team, they’ve gone right at the perfect time. Opening Atlantic 10 play with a 5–1 start, the Colonials have gotten back into the swing of things. The team has sparked new life into its season by besting league rivals, completing a three-game series sweep of La Salle and taking two games against St. Bonaventure. Practicing new drills on the field has helped the Colonials get more effort out of each player, and winning has the team clicking in the dugout. The biggest jump between non-conference and A-10 play for the Colonials has come at the plate. GW owns an overall .281 batting average across all contests, but hit an impressive .328 in its first seven conference games – the best in the league. 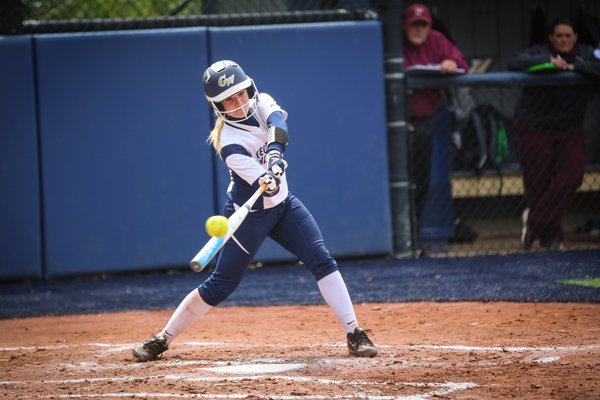 GW used a mid-week tuneup against non-conference opponent Coppin State Wednesday to prepare for a weekend series against Fordham. The Colonials got the chance to refine some of their skills and to experiment with new batting techniques, pitches and lineups. “This is a great time for us to practice and tune up on some skills and figure out what is going to work for us as we make our way further into A-10,” junior outfielder Monica Macchiarulo said. Recently named conference co-player of the week, Macchiarulo has helped lead the charge in A-10 play with a conference-leading .591 batting average in her first 22 league at bats. Macchiarulo batted a .562 during the La Salle series last week and successfully stole six bases. On the mound, sophomore starting pitcher Sarah Costlow was named ECAC Division I Pitcher of the Week after the team’s series against the Explorers. Costlow boasts a 2.51 ERA overall and a 1.75 ERA against conference opponents. This past weekend, GW hosted Fordham, an A-10 powerhouse who has captured the A-10 title four of the last five years. The first-place Rams swept the Colonials, but the GW bats combined for nine runs over the three-game series and took the defending champions to extra innings on Sunday. Despite its latest skid, softball’s strong performances at the plate to open league play demonstrated its potential to make a run for the title this spring. The team’s pitching staff, which conceded 21 runs to Fordham this weekend, will need to improve, but Schramm knows confidence remains key for a deep conference run.